Garner instant traffic and lead generation through the use of optimized search engine marketing. 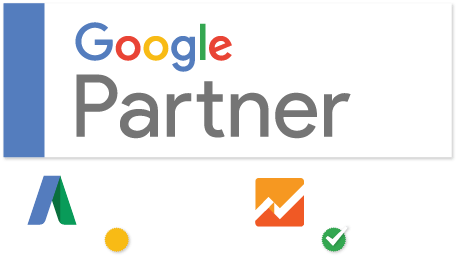 As a Google Partner, you can trust our team to create dynamic lead generating search engine campaigns to grow your business. Our certification ensures quality keyword research, marketing strategy and campaign management. Position your business as the solution a customer is looking for. Pay-Per-Click Advertising (PPC) gets your business in front of internet users with the use of text and image-based web ads. We utilize Google’s Adwords network to build out a PPC campaign. Having identified your target market, we create a list of keywords that your audience is using to search for businesses that offer your services. From that list, we create ads that are distributed across Google Properties as well as on partner sites, newsletters, and email. AdWords ads reach millions of people worldwide every month and are seen by over 80% of internet users in the United States every month. Remind past visitors to come back. Part of our PPC campaign includes Retargeting Ads. Up to 90% of the B2B buying process takes place before speaking to a salesperson. If you re-engage users during this critical research phase by implementing a cross-platform retargeting campaign, you can increase lead conversions and create loyal customers. Retargeting translates first-party customer data about website visitor behavior into highly relevant, targeted advertising campaigns. By targeting users who are already familiar with your business, we can nurture a lead into a conversion with relevant ads.